Some people think dirt is uninteresting. Shortly after the Curiosity rover landed in 2012 I was asked to give a special talk to a very distinguished group of people. The slides had to be prepared a couple of weeks in advance and were sent from my director's office to be reviewed by handlers in the state where I was to give the talk. Those first days of the mission were breathtaking, and my presentation included the video of the landing, taken from the MARDI camera, mounted on belly of the rover, as it descended. In that scene, the dust gets kicked up by the sky crane's rocket engines as the rover nears the ground, and eventually the picture becomes rather dark as the rover's shadow covers the ground, but the first precious glimpse of a few pebbles can be made out, signaling a safe landing on an exciting new terrain! I was in the middle of operations a couple of days after submitting the presentation when I noticed that I had just missed multiple phone calls. It turns out that the handler didn't like some parts of my presentation. Word was passed on to administrators at my institution: "You have to get rid of that video--it just shows a bunch of dirt!" I got on the phone and calmly explained that the offending sequence was in fact the very first Mars-landing video. My manager nearly fell off his chair laughing when he learned what it was. The person who didn't like the landing video probably would have equally disliked (or mistaken) a video of the first Moon landing, which also set down on "just a bunch of dirt." 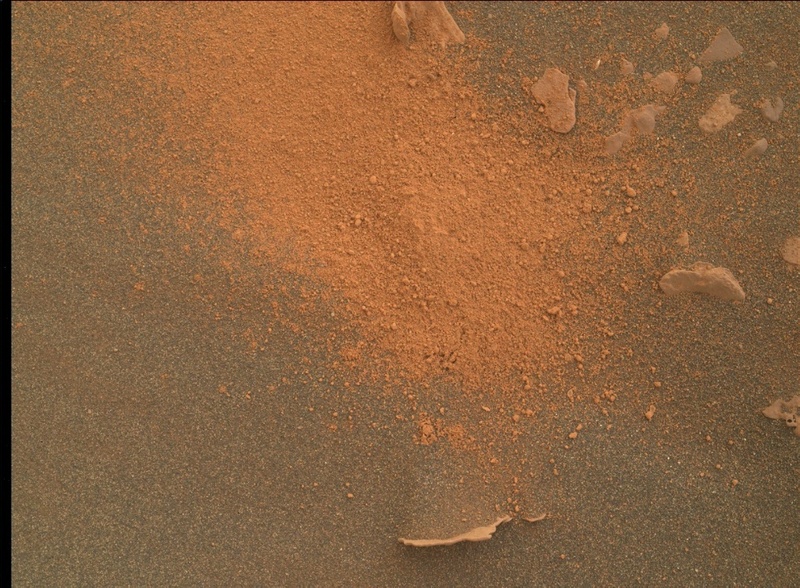 Tosol Curiosity's "bunch of dirt" is the dump pile consisting of drill tailings as seen in the MAHLI image above (roughly 16.3 by 12.2 cm in dimensions), and the tailings bunched around the drill hole itself. The rover starts its science activities with Mastcam and ChemCam passive multispectral observations of the dump pile, and Mastcam and ChemCam active interrogation of target "Elbow Creek" (a vein). The arm then moves MAHLI into position to get 25 and 5 cm close-ups of the drill hole and the surrounding tailings. In the evening MAHLI gets turned on again to do nighttime imaging of the CheMin inlet on the deck of the rover, and then it goes back to the surface for nighttime imaging of the drill hole. After that, APXS is placed in position on the dump pile for an overnight integration. In between these activities the rover will continue observing the dust and surroundings: Mastcam continues a change-detection series of daily observations of the nearby surface, as well as looking at the observation tray and getting a view out to the crater rim. RAD, DAN, and REMS continue their daily investigations, as usual.